Antique woodcut engravings which were published in "The Illustrated Sporting and DramaticNews" on April 1st, 1882. Later coloured by hand.The team was S. Fairbairn, Ll. R. Jones (bow), C.W. Moore, P.W. Atkin, S.P. Smith (stroke), J.C. Fellowes, E. Lambert, P.L. Hunt (cox) and M. Hutchinson. 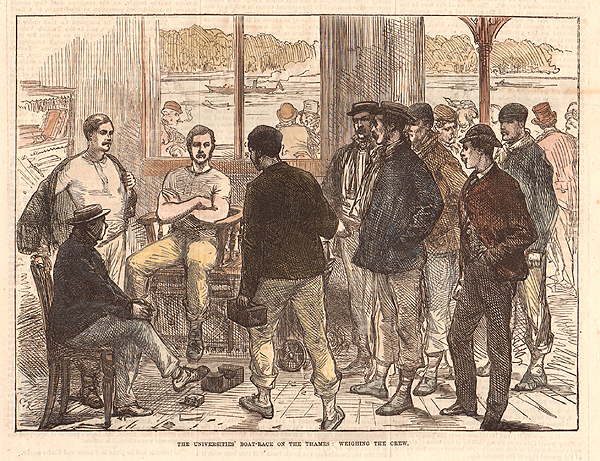 The Universities' Boat - Race on the Thames : Weighing the Crew. 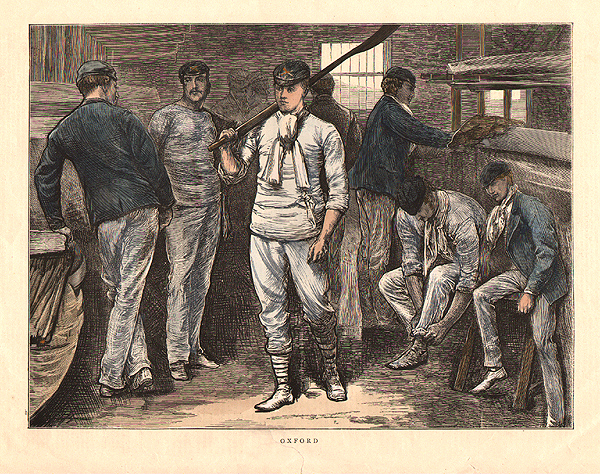 An antique woodcut engraving wich was published in "The Illustrated London News" in 1874. Later coloured by hand. The Oxford and Cambridge Boat Race. 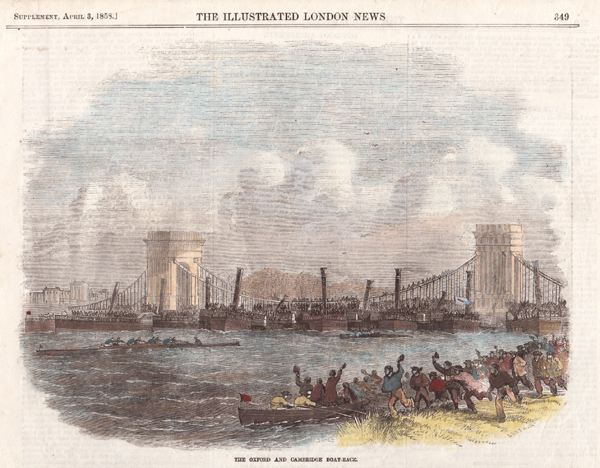 An antique woodcut engraving which was published in "The Illustrated London News" on April 3rd, 1858. Later coloured by hand. An antique woodcut engraving which was published in "The Graphic" on March 23rd, 1872. Later coloured by hand. The Oxford and Cambridge Universities' Boat-Race. 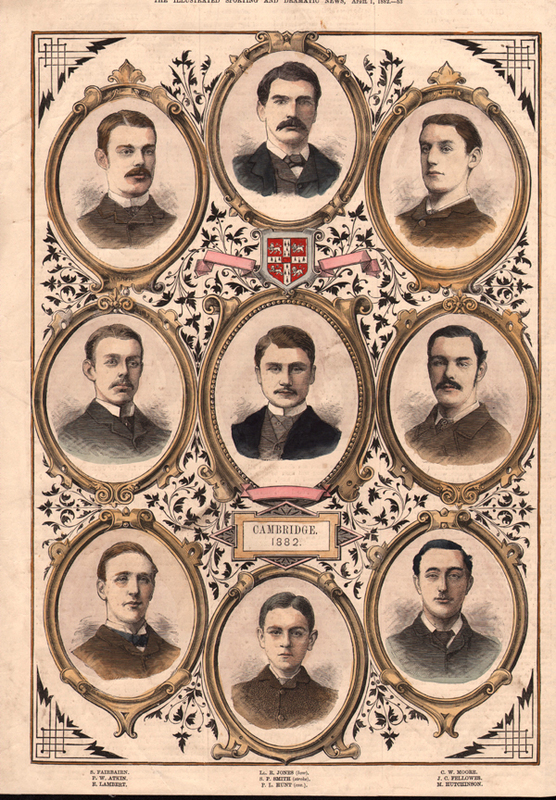 The Cambridge Crew and the Oxford Crew as they appreared in "The Illustrated London News" on March 22nd, 1890. The names of all the crews are shown. Battle of the Boats at Chiswick. A woodcut engraving entitled "Battle of the Boats at Chiswick" published in "The Illustrated Sporting and Dramatic News" on March, 31st, 1877 The colouring is later. The reverse of this page contains an account of the race and includes names and weights of both Oxford and Cambridge crews. Part of top margin missing. A woodcut engraving entitled "The Albany Club, Kingston-on-Thames" drawn by E.K. Johnson, R.W.S. Circa 1890. The colouring is later.